This profile first appeared in the Feinberg Research Office’s Breakthroughs Newsletter. 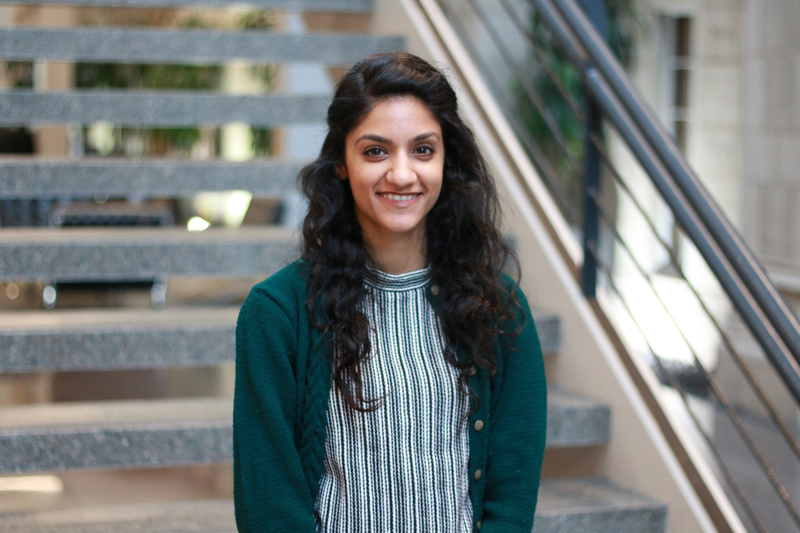 Kritika Nayar is a fourth-year student in the Clinical Psychology PhD Program. Kritika Nayar, a fourth-year student in the Clinical Psychology PhD Program, studies visual perception and its role in autism spectrum disorder in the laboratory of Molly Losh, PhD, associate professor of Psychiatry and Behavioral Sciences, and associate professor and the JoAnn and Peter Dolle Chair in Learning Disabilities in the School of Communication. Nayar earned her undergraduate degree in neural science and environmental studies from New York University. She discovered her passion for working with children with autism in high school and plans to continue working in pediatric neuropsychology after she graduates. I am of Indian origin and grew up and lived in Hong Kong for 18 years before moving to New York City for college. I am fascinated by the complex and broad deficits that are associated with neurodevelopmental disorders, particularly autism spectrum disorder (ASD). I am interested in exploring the neuropsychological profiles associated with ASD, and in particular how visual perception may contribute to core deficits and other clinical-behavioral traits. I am also interested in investigating whether these neuropsychological features are present in more subtle forms in parents of individuals with ASD. In Dr. Molly Losh’s Neurodevelopmental Disabilities Lab, I am involved in many exciting projects. My doctoral work focuses on using a combination of eye-tracking and electrophysiological (EEG) methods to survey visual processing styles in individuals with ASD and their biological parents. By taking this neurocognitive, multi-method and family-study approach, I hope to more holistically characterize the cognitive mechanisms that may importantly relate to the ASD phenotype. By studying parents, I hope to explore whether there are underlying neural markers of visual perception that might be candidate endophenotypes (or, heritable characteristics that map onto common underlying biology), helping to pinpoint their genetic etiologies. What attracted you to the PhD program? I was drawn to so many aspects of the PhD program, making it my number-one choice. I was drawn to Dr. Molly Losh’s studies of ASD, which take a family-study design to explore endophenotypes, using multiple methods of assessment (e.g., eye tracking and language assessments). Additionally, her work exploring neuropsychological profiles in ASD and associated disorders was particularly appealing. Also, the clinical psychology doctoral program allows me the opportunity to concentrate in both child and adolescent psychology as well as neuropsychology, beautifully bridging together my clinical and research interests. What has been your best experience at Feinberg? I have enjoyed and loved every aspect of Feinberg and my experience thus far. The people I am surrounded by have really helped to enrich my experience during graduate school. They have helped to cultivate my intellectual curiosity further, while at the same time embracing the “me” that I am today. My journey through graduate school has also allowed me to explore larger existential questions. How would you describe the faculty at Feinberg? Faculty members in my program are incredibly friendly, hard-working, and brilliant role-models. They treat the graduate students with respect and as peers, supporting us to be the best psychologists possible! I love that the faculty can walk the humor and professional line so elegantly. I’m fortunate to be surrounded by such supportive faculty members. I hope to be working in a medical center, to avail myself of the numerous resources available through a setting like Northwestern. I plan to continue pursuing research in ASD while simultaneously seeing patients as part of my pediatric neuropsychology practice. I am looking forward to seeing where my work and experiences take me.